Plan B Burger | Eat It, Damn It! Chi-Chi Fu-Fu (pronounced Shee-Shee Foo-Foo). I don’t know if that’s the correct spelling, but that’s what a former co-worker used to describe fancy places, the kind of place that will serve you Chocolate Asparagus braised with Duck Phartz. I’m not advocating class warfare. I have nothing against fancy food fusion. 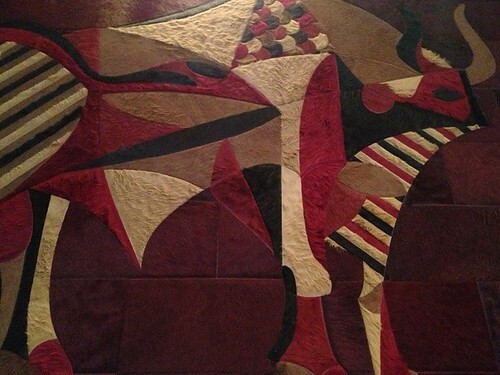 Sitting at a place with great ambiance and experiencing a unique culinary creation crafted by a master food artisan is a great way to spend an evening. 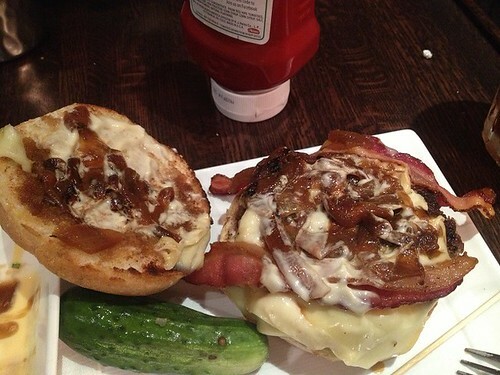 …but does a burger need to be fancy? MG and I started off with the Blue Chips ($7.99). 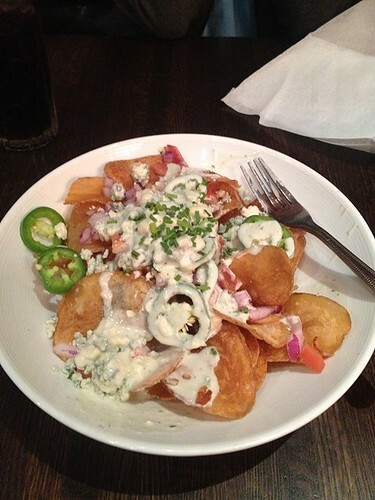 The menu lists it as “House Made Potato Chips topped with Tomatoes, Warm Blue Cheese Sauce, Bacon, Red Onion & Jalapenos”. MG is still sans dairy and gluten, so she ate around the cheese and sauce. The chips are great. They are crispy. The blue cheese sauce has a good balance between cream and funk. 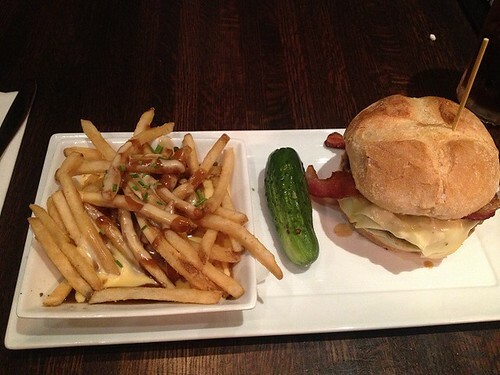 Flecks and chunks of bacon are dotted throughout the dish, and the jalapenos are freshly sliced, not pickled. I’ll give the scholarly answer and say it was “interesting”. I loved all the individual components, but not sure that I liked them together. Everything is fresh and tasty, but I don’t think blue cheese and chips are a perfect marriage. To be honest, I thought this when ordering the dish. However, I was curious. If you like the combination of blue cheese and crispy potato, definitely order this dish. If you are on the fence, there are other interesting options. The star of the show, I got a Bacon Cheeseburger and opted for Disco Fries ($13.78). The disco fries were superb. The fries were crispy and well salted. The gravy had an excellent beefy flavor that was wonderful with the soft, creamy, well-melted cheese that went on top. These fries would make a spectacular drunk snack. If you like disco fries at all, you must order these. Check out the inside. The cheese is plentiful, but not overwhelming. The bacon is tasty and crisp. The white stuff you see on there is garlic mayo. It’s a great addition if you like mayo, and the garlic flavor is not overpowering. The burger? Short answer? The burger is good. If you need a burger and you go to Plan B, I don’t believe you will be disappointed. However, I have to add a few thoughts. When you order a burger you have the option of “Some Pink” and “No Pink”. What was the matter with “Rare”, “Medium”, and “Well Done”? I went with Some Pink. What I got was a burger that was a little closer to medium than rare, but pretty near the rare side in the middle. For some people, that’s great. I usually like my burger a little past medium. Granted, I could have said that, but I just went with their system. Next time, I’ll specify what I want and see what they do, but I think their current system is just messing with a tried and true description system. The bun is very nice. It holds up well to the loosely packed beef disc. It is not especially soft or crusty, but just nice. 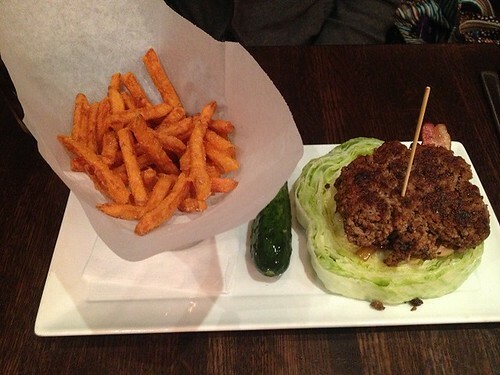 MG got a Bacon Burger on Grass with Sweet Potato Fries ($14.78). She has had it many times before and really enjoys the dish. She hates that they use iceberg lettuce. For the price, she may have a point. It might be nice if they served it on a few leaves of Romaine with a smattering of Arugula. Nevertheless, she likes this meal. The sweet potato fries are pretty great. They are crisp and well salted. Thumbs up. The walls are dotted with what I call “Furry Art”. I don’t know the proper name. It’s not a painting, is it? I mean, it’s not painted. 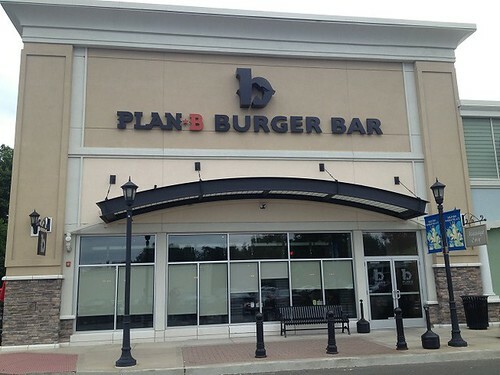 I’m not going to dismiss Plan B as a fancy-pants burger joint. They make a nice burger. I could nitpick and say that burger could have a better crust or could use more salt, but I think that would be unnecessarily critical. Their burger is good. They have some tasty appetizers and sides. An extensive beer and liquor list is not a bad thing. If you want a quick, fast-food style burger, Plan B is not the spot. They don’t make a life-changing burger, but their offering is very respectable. If you want to sit around, sip a few cocktails and enjoy some slightly higher end bar food, Plan B is ideal. They have a few locations, so see if one near you sparks your interest.